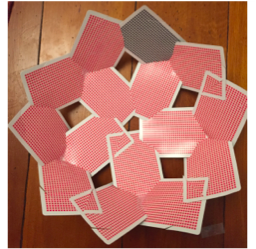 Editor's Note: Maja M. ('16) attempts to make a deltoidial hexacontrahedon. This is the shape that I attempted to make. I found the image on George Hart’s website. 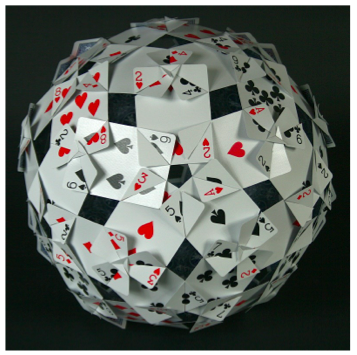 This shape is made out of 60 cards and the last one that I made for my previous explore math was out of 30 cards. I wanted to make one that was larger that my last one, and I could only find this on George Hart’s website. I had to cut four perfectly even slits into 60 cards, which took an extremely long time. 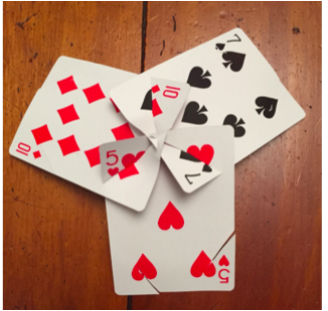 My next and only instruction was to join three cards in a 3-fold lock. I had an image to go by and my instruction was to make 20 of them. Making the 3-fold lock was one of the hardest parts of the process. Connecting two cards together was simple but trying to add the third was really hard. A lot of bending was necessary. I ended up ripping multiple cards in my attempt to connect them. They were supposed to become planar when finished in order to keep the entire shape from falling apart so I had to be really precise. The next step was the simplest one. I had to connect the three fold locks to make a five fold star. The image on George Hart’s website was directly of the face of this five-fold star so I could easily look on with the image to see what it was supposed to look like. I didn’t have images from any other angles so that’s why this was the easiest part to create. I made four of these shapes. The next step was to connect these four shapes to make the deltoidial hexacontrahedon. This was the most challenging part and where I gave up. I worked for hours trying to figure out how to shape the four parts together and I could not figure out how. I had no instruction to go by because the image only shows one side of the shape. I just had to guess and check. 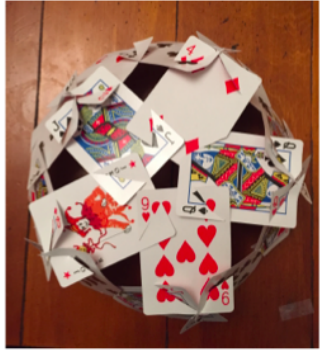 I connected the cards with different slots and at different angles in an attempt to create the circular shape. At one point, when I thought I had finally made it, it ended up being more of an oval than a circle. I connected most of the cards together but when looking over the shape overall I realized that I had left a few slots open, causing the shape to be longer rather than wider. Overall, I spent many, many hours attempting to create this shape and it proved to be a great difficulty. After the sixth or seventh hour working I decided I had to give up. I left myself with no time to complete the other portions of the project, which I wish I had been able to do. I am interested in how this might eventually turn out so I may work on it over the summer or another time when I have a few hours to give to this project.